Here are a few superstitions and superstitious warnings to help keep you safe or have more luck in your life. Some of these you may have heard of and others no. Along with these are some of my observations about them. 1. Do not take any risks or attempt any new enterprise on Friday the 13th. 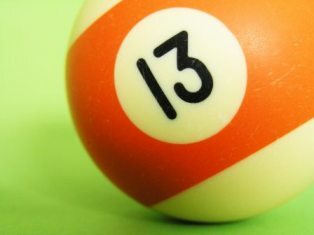 The number 13 is catastrophic. It represents the number of men present at the Last Supper. The Greek philosophers and mathematicians scorned it as an “imperfect” number. In Norse mythology, there were 12 gods present when Loki, spirit of evil and dissension, stormed a banquet hall (making him the 13th guest) and killed Balder who was a hero and most revered of all the gods. Historically, Friday is not a good day. Jesus died on Friday. Adam was tempted by Eve with the apple on that fateful Friday. The biblical Flood began on that fatal Friday. 2. Do not take any risks on January 1st of the New Year. Traditionally the first day of the New Year sets the tone for the rest of the year. Taking risks that could turn out badly could follow you during the year so it pays to be careful. This is actually just part of a long list of things to be aware of on January 1st. The general theme of all of them is to be careful and take as few risks as possible so any negative actions or results won’t follow you during the coming year. I thought this was just for farmers or people with ranches with horses, but I noticed my neighbor, who does not have horses has a horseshoe hung over his door at the entrance to his house. The neighbors across from him have their mailbox post made out of a column of horseshoes, which in both cases are facing up as required. 4. Do wear clothing inside out. It is an excellent disguise to keep Death from recognizing you and singling you out as its victim. I doubt many people would do this knowingly nowadays, but it might be rare, but I have seen someone with a piece of clothing on inside-out, like a T-shirt, socks or a blouse. When I have seen such an unusual sight I’m sure it was by accident and not to keep death away. 5. Do not get married in May. The Romans honored their dead in that month, and it is a very unlucky time for lovers. When a couple is ready to get married not too many will put it off just to avoid a wedding in May. June is said to be an opportune time and lucky month to get married, according to Roman mythology, but statistics in the USA don’t indicate June is any better than any other month, since proportionally just as many marriages of June end in divorce as any other month. 6. Do knock on wood (3 times) after mentioning good luck. The religious significance of wood comes from the Crucifixion of Jesus on the Cross. Also, man was once in awe of lightning bolts which struck the trees in the forests. He believed that the god of lightning resided in an oak tree. To knock on wood insures that your good luck will continue. Depending on where you’re from you might still observe this tradition. When I visited Chicago I observed this knock on wood tradition several times. Mostly the older generation might sometimes follow this old superstition. 7. Do cross your fingers and wish for good luck. This is an old superstition and one in which children follow when they wish for something to come true or happen. Of course adults can and often do cross their fingers, wishing for good luck too, when they really hope something they want badly will come true. 8. Do enter and exit from the same door when visiting a friend’s house. If you leave for a while and then return-sit down outside the door and count to 10 before your 2nd entrance. On New Year’s Day there was a tradition of the first-footer who crosses the threshold after the New Year has started to leave through a different door than the one he came in from after he left his gifts and well wishes. Not exactly the same as this superstition, but similar to the first part of it, the other day I left the house to go to the bank and store. On the way I had a real close call right near the bank and just barely missed two bicyclists riding along the side of the road. It was my fault too. I was so shook up that I cancelled my trip to the store. I felt my luck was giving out on me that day so it was far better to go back home than risk more troubles that day. I stayed inside the remainder of the day.